Last week marked Fat Tuesday, and this got me to thinking . . . not about beads & booze and a celebration I never celebrate, but of many past visits to New Orleans, and some of my favorite cajun cuisine. For many Southern dishes there is no shame in busting-out the deep fryer. There’s a time when heating a large container of oil until it’s hot enough to burn your face off just feels right, and the the golden results are glorious! Though I don’t eat fried foods often, It’s hard to resist fried catfish every now & again—I grew up with it. One of my favorite preparations is in a Louisiana-style Po’ Boy (or delectable sub sandwich if you’ve never had one). This sandwich is built around our crispy fish, cradled in a French sandwich roll, adorned with shredded lettuce, tomato, pickle, and in my case a quick & creamy rémoulade. Since we’re splurging and have a hot tub of canola at our disposal, I decided we’d take this po’ boy one step further and fry the dill pickles, giving us a tangy and crunchy topper. 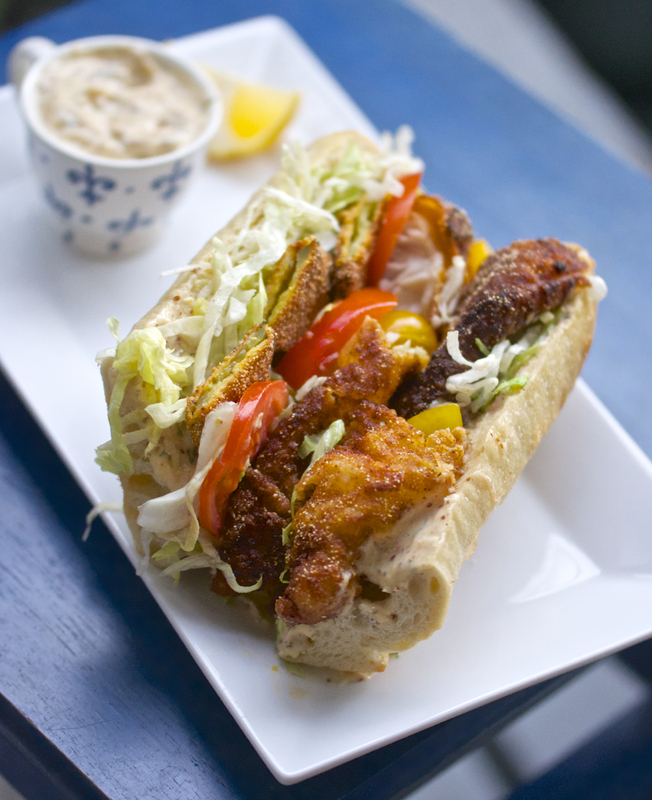 Bring a little bit of NOLA home, with this southern-style fried catfish po’ boy! A crispy and tangy sandwich with the addition of a lemon remoulade sauce and fried dill pickles! In a medium bowl whisk together mayo, mustard, lemon zest, lemon juice, pickle juice, creole seasoning and pepper. Stir in fresh chopped parsley, minced garlic cloves and check flavor, add salt if needed (remoulade will be creamy but bright and tangy). Cover bowl and refrigerate until serving on sandwiches. *(while catfish is frying, place dill pickle slices in a single layer in shallow dish and cover with 1 cup of buttermilk, let sit until fish is completed ~10 mins). 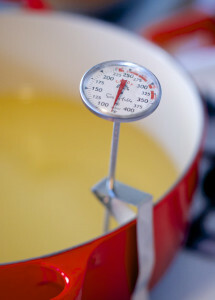 In a large pot (or enameled cast iron dutch oven) add oil for frying & attach candy/fry thermometer to side, letting oil preheat on medium/low until 350 degrees F (this may take ~15 or more mins, increase to medium heat if necessary to get to 350—we want to keep oil temp consistent). Rinse and pat dry catfish filets, if large cut into smaller portions for frying (these should be skinless with no bones). Sprinkle fish lightly with fine sea salt & ground black pepper on both sides. Using a shallow container combine dry ingredients for fish fry batter: flour, corn meal, creole seasoning, mixing well with a whisk. In a second shallow container, pour the buttermilk and dredge fillets coating both sides. Next dredge fillets in dry batter mix, pressing down to coat evenly on both sides (shake excess dry ingredients off fillets). Let coated catfish fillets sit on a wire rack for 10 mins while oil preheats. Gently place coated catfish into pot of heated oil (carefully using a slotted spoon), one filet at a time (oil will bubble instantly). Let fillet cook for about 5-6 minutes until crust is a golden brown & crispy (I gently turned fillets over in oil halfway through frying). Once first fillet is done, remove from oil carefully & place on wire rack with baking sheet underneath (place in 200 degree oven to stay warm while frying other fillet & pickles). In a gallon-size Ziplock bag, combine 1 cup flour, 1 cup cornmeal, creole seasoning & ground black pepper—shaking to mix thoroughly. Add a few buttermilk-soaked pickle slices into the ziplock dry mix in batches, shaking/handling to coat each slice completely (set aside coated slices on a plate until finished). Once all slices are coated, place them carefully into the still 350 degree pot of oil to fry. Fry chips ~3 mins until golden brown & crispy using heat-safe slotted spoon or tongs to gently flip over slices in oil to brown evenly (they will puff a bit at first), then remove from oil with slotted spoon and drain on paper towels). Remove catfish if warming in oven. Slice to split sandwich rolls almost completely, leaving bottom seam connected. Coat a generous portion of our prepared remoulade sauce to both insides of roll (I used ~2T worth). Add pieces of fried catch (or cut fried fillet into chunks) along one side of the sauce-coated roll. next to fish add shredded iceberg lettuce (!1/2 cup worth), a few thin tomato slices, and several of the fried dill pickle chips. Serve & enjoy sandwich immediately, adding extra remoulade as desired! Catfish is one traditional fish used for fry in the south, but if you do not have fresh fillets available, cod, orange roughy, or another mild variety can be used instead! The remoulade sauce can be made a day ahead and stored in the refrigerator. The sauce can also be doubled, and works well as a dip for any seafood instead of tarter sauce. Cut uncooked catfish filets into smaller ‘chunks’ for more breading when frying, or leave as whole filet then fry and cut (I prefer this way). If not frying the dill pickle chips, sliced dill pickles from a jar are also a great addition to this sandwich. This isn’t hard to execute nor does it take long to cook, but this operation can get a little messy. I used canola oil due to a peanut allergy, but traditionally down South you’ll find most places will fry with peanut oil—it can handle high temps well. Using my enameled cast iron pot and a fry/candy thermometer hooked along side, we’re able to control the oil temperature and not burn our delicious fishes. The type of sandwich roll is also crucial! Po’ boys are traditionally served on a French-style split roll that is both soft/light inside and light/crisp outside. Unfortunately, my craving for catfish was ill timed with my local baker, and they had no such rolls in stock. I instead substituted a fresh French baguette that was fairly soft & wide. It was good, but a little too chewy for our delicate fish. Next time there shall be roll redemption—I’ll hit the bakery bright & early. With so much oil at my disposal, I wanted to further purpose it. Fortunately I refrained from State Fair-style fried butter & Twinkies—which I’m sure would go swimmingly in our used fish oil—but instead settled for frying dill pickles! Since pickle slices were already fated to top our sandwich, this seemed the perfect fit. I have to admit these little guys were pretty tasty solo, disappearing right before my eyes, so a second batch was required. Despite all of this crispy goodness, we’d be nowhere without a sauce—I’m talking about YOU zesty Remoulade! This creamy lemon concoction is really the glue binding our po’ boys together. It’s mayo-based and super easy to assemble with a few pantry ingredients including: garlic, creole mustard & dry creole seasoning (for an extra kick). Creole seasoning traditionally contains a variety of dried peppers, garlic and salt (I prefer Cajun’s Choice brand due to it having less added sodium, but they’re all pretty similar). Until my next time to New Orleans, I’ll just have to splurge with this scrumptious sandwich from the comfort of home. Bon appétit Y’all!